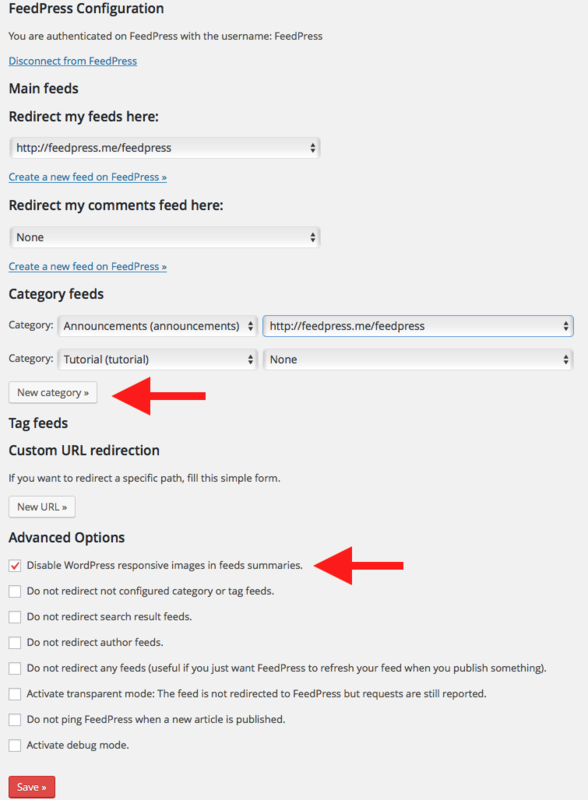 If you’ve been using FeedPress for a while, you likely are aware we’ve had a WordPress plugin available. Our plugin for WordPress has always been a companion to the service, which makes it quick and easy for new customers to get setup with analytics on their existing RSS feeds. The plugin handles the redirection of your feeds, in addition to a few other more advanced options. Today we’ve released version 1.7, which is a substantial update with respect to improved user experience, so I feel compelled to write about it. We’ve been compiling the most common support requests we receive from customers with respect to road blocks they run into during setup–some are common and others are edge cases. Today’s update addresses the major stumbling blocks some have run into, which we hope will help those getting started. Automatic syncing of your feed URLs and hostnames. Previously if you had added a new feed to your account, the plugin didn’t automatically check to see if anything had changed in your account. We now check for things like this, in addition to other feed related changes. This was our number one complaint and I’m pleased to say this is a welcome improvement. Autonomous checks for any feed redirection error. If for some reason any of your feeds have a redirection issue, we check for those and let you know if there’s a problem, that way you don’t find out the hard way when something has been broken for a while and a reader of your blog or listener of your podcast complains. Better way of adding custom feed redirections (tags, categories, Urls). Using multiple categories or tags to specify which articles or podcasts appear in a feed is quite common in WordPress. Prior to 1.7, you could only redirect a new category or tag one at a time, and you also had to save changes in between. This is totally not an efficient or pleasant way of doing things, so we’ve gone and changed that. You can now redirect multiple categories or tags in a row without having to save changes and refresh the settings page. Added a setting to disable responsive images in feeds summaries. As of WordPress 4.4, which was released this month, responsive images are now fully baked into core. This is really nice and a welcome addition to WordPress, however, it appears that some podcast apps do not fair well with this, such as Overcast. We’ve seen some issues with feeds with embedded images display markup in Overcast, so we’ve added an option in our plugin to disable responsive images for feeds. We recommend enabling this if you’re seeing an issue with Overcast and images in your posts. Please update your FeedPress plugin today. If you haven’t grabbed the plugin for WordPress yet, make sure to do so!